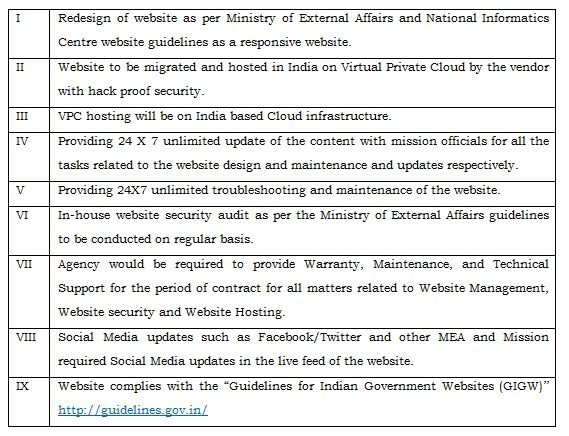 Request for Proposal for Redevelopment and Maintenance of Website for Indian Mission to ASEAN, Jakarta and migration of Mission’s Website on Virtual Private Cloud Infrastructure. The Indian Mission to ASEAN, Jakarta (hereinafter referred as “ASEAN-India Mission”) website can be accessed at www.indianmissiontoasean.com . The website provides vast amount of information through various section/web pages. The website provides latest updates on India’s relations with the countries of the Association of South East Asian Nations (ASEAN). The website also provide information related to Press Releases, Announcements, etc. Indian Mission to ASEAN, Jakarta, therefore, intends to avail services from firms/agencies having experience of developing and maintaining websites.